Anything But Chardonnay ("ABC") Wine Reviews periodically provides our readers with current promotions that offer discounts or other incentives for purchasing wine or wine-related products and services through our partner websites. Below is an offer we recently received that we're pleased to pass on at this time. My Wines Direct is offering two special deals for March. Save $10 on the Tour the World of Wine Pack. 3 reds (Spain, Argentina, California) and 3 whites (France, California, Australia), now just $84.95 and free shipping. Use code Tour10 at checkout. Save $5 on the purchase of ANY product. Use code SAVEMARCH5 at checkout. Both these offers expire 03/31/2009. 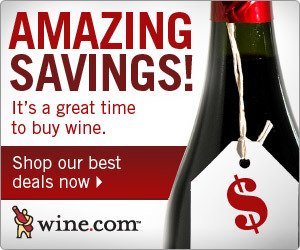 Click on the banner link below to begin shopping at My Wines Direct.